Lotus Cup Europe returns to action at the Hockenheim Historic meeting on 20-22 April, an event that will celebrate the life of Lotus and motor racing icon Jim Clark, 50 years on from his untimely passing at the German track. The FIA International Series has been part of the race programme at this event for several years, and it adds a contemporary splash of colour to a historic-heavy race card. 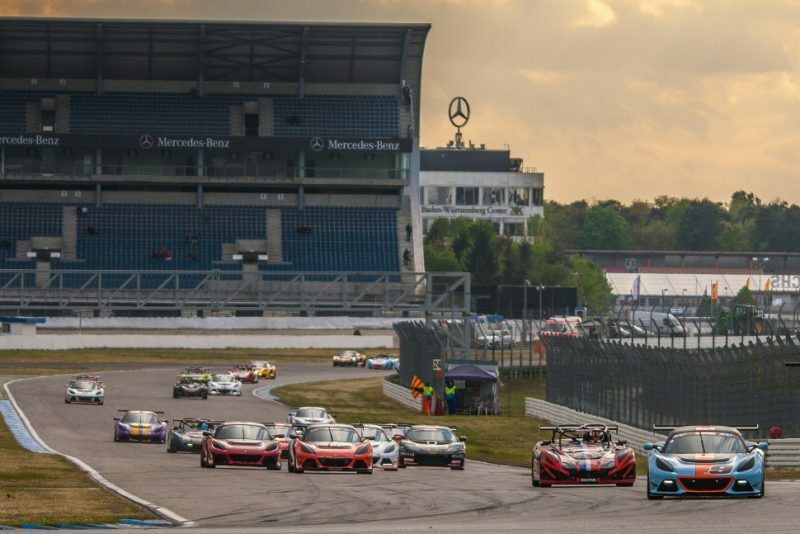 Another huge Lotus Cup Europe entry will head into qualifying on Saturday, and topping the list will be reigning champion John Rasse, who last year became the first man to win the title twice. The Belgian is also the first champion to win the title from the V6 Cup class; whilst the overall race winners this weekend are most likely to come from this category, so fierce is the competition here that it’s hard to beat a points system that favours class wins above overall results. With a brand new car, Rasse will have his work cut out; the V6 Cup field includes another former champion as well as several race winning drivers. Having stepped up to V6 Cup last year, 2016 champion Tamas Vizin from Hungary is now on top of his Exige, taking pole position in last year’s finale at Le Mans. Title challenger Xavier Georges from France can never be discounted, nor can British Lotus racing veteran Steve Williams in his Evora GT4. There’s a long list of drivers in the V6 class that could spring a surprise result too; these include Britain’s David McInulty, now joined by his brother Jason from the Production ranks in an Evora GT4 after he won the class title last year. Hungary’s Bence Balogh enjoyed a strong weekend here last season, whilst Belgian Lotus dealer Thierry Verhiest is a regular podium contender, and the Swedish Exiges of Daniel Palma and Robin Nilsson should also be stuck in the action this weekend. Often snapping at the V6 cars, and on occasion stealing an overall race win are the 2-Elevens. Last year Frenchman Christophe Lisandre defeated the V6 machines in the opening race of the season, and the reigning class champion starts as favourite for category honours. Christophe’s opposition comes exclusively from his compatriots, with sibling races Franck and Christopher Laroche the most likely to challenge. Philippe Loup and Jean-Pierre Genoud-Prachex are odds-on for a class podium, while JP’s wife Nathalie is one of the most reliable drivers on the grid and is sure to score good points. Open class champion David Harvey returns for another season in his 340R, and faces an expanded list of opponents this season, all from the UK, with both Matt Bartlett and Pete Storey back in action, whilst Ian Fenwick, Andrew Wright and Dave Carr will be challenging for honours. Finally, expect plenty of excitement in the Production ranks, and with the Elise Cup R now proliferating in the field, many drivers will be in the fight for victory. The cars in this class are quite a few horsepower down on the other categories, but are just as entertaining to watch. Last year’s class runner-up, Swede Sven Pettersson will start as favourite, but having switched to the newer model late last year, France’s Thierry Hedoin will be looking to return to his lead-challenging status from a couple of years back. Briton Mark Yates also upgraded with encouraging results last year, and Swede Cai Cederholm is making good progress with his car. From the non-Cup R ranks, Paul Pattison claimed third place in the Production standings last year with his Series 1 Elise and he’ll be looking to build on that success this year. German driver Jan Christie makes a welcome return to Lotus Cup Europe, whilst Britain’s James Knight is back to cause a stir. This year’s champion could come from any one of the four classes, courtesy of a points system that awards class success, so all of the drivers have everything to play for. Two half-hour races will get the 2018 season underway, and with both rolling and standing starts employed, there will be much to look forward to in Germany this month.